Bonefish Grill – Fish Ahoy! It was an icy cold night when I made my way to the new Bonefish Grill in Mercer Mall for a social media dinner I was lucky to be invited to. They opened to a splash (sorry!) last Monday, after a Saturday fundraiser for Womanspace that netted a cool $11,000 for the agency. Kudos to them for that! I was definitely the more senior member of this youthful blogger group, but what fun it was to share a meal at a high-top table in the bar (and not too noisy in there!) with a like-minded group who were all just as intent on photographing their food as eating it. My friends are so tolerant of my frequent photo-taking at meals, although lately I’ve tried to curb myself when I’m just out to relax. 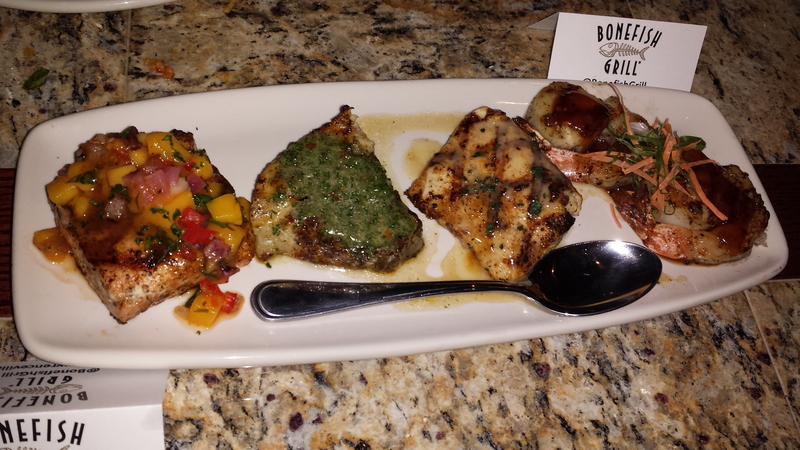 But at the Bonefish Grill event, the photos (and my subsequent blogging) were sort of the point. First off, I like that Bonefish Grill is not one of those huge, cavernous spaces, and the noise level in the bar, while lively, did not impinge on our conversation, much less, one assumes, in the dining room across from the bar. During our meal, the managing partner of this location, Hank Trueblood, visited our table to talk about the food, and his enthusiasm was evident. We sampled several appetizers, including their very popular Bang Bang shrimp. This is (to me) like a mildly spicy version of that popular Chinese-American restaurant dish of battered, fried shrimp in a sauce based on mayonnaise, often with walnuts and maybe a little orange liqueur. The Bang Bang sauce has a spicy component instead, based on numerous copy-cat versions online maybe sweet chili and something like Sriracha sauce. There is just a light coating of sauce here, however, and this was a popular item, but to my surprise I was even more taken with the Wagyu Beef + Ginger Dumplings with crispy onions. Briefly seared ahi tuna sashimi was good too, and overall, it was hard to resist more of each of these. Now, for the main event, the fish, which was presented to us for sharing as a mixed grill. We love our fish in New Jersey, and while I don’t see local fish on the menu (hard for a chain to do), each of these fillets was cooked perfectly, moist, flaky, and each with a different sauce, and wonderful wood-grilled flavor. The large scallop nestled in a shrimp, ditto. So, in the photo, we have salmon with mango salsa, Chilean sea bass with herb pesto (like a mild chimichurri), mahi mahi with lemon butter, and the shrimp/scallop combo with an Asian sauce. The Chilean sea bass and mahi mahi stole the show for me, but whatever your favorite fish, it will be well-treated here. We were also brought a sampling of the many sides you can choose from, potato gratin (sweet potato I think), mashed potatoes (lots of butter! ), and chickpeas that were quite good. For those who aren’t big on seafood, of course there are other options like pasta, chicken, steaks, and a Fontina pork chop. And there are various other seafood options that go beyond simple grilling, plus lobster tails and crab cakes. I was pleased to see that, while I usually avoid heavily salted dishes when eating out, the more simple fish preparations here are the lowest in salt, according to the nutrition information on their website. Desserts were also good, especially a pair of vanilla and chocolate crème brulées. (We decimated those before I could get a photo!) There was also a very decadent gluten-free brownie (they have plenty of gluten-free items), key lime pie (tasted like real key lime), and cheesecake with seasonal topping (apple for winter). Gluten-free (flourless) macadamia nut brownie with raspberry sauce, ice cream and whipped cream. Thanks for the recommendation Faith. I hadn’t heard of this new restaurant, but now I’ll give it a try.